Who Is Moonlight Rentals / Saddle Ridge Rentals? We are a family owned property management business that adores Big Sky, Montana and sincerely believes that your vacation here should be your best ever. We love to ski, snowboard, hike, fish, and enjoy the amazing Montana sky and outdoor activities. We know Saddle Ridge, Cowboy Heaven, Moonlight Basin, and Big Sky extremely well, and we believe there is no better place to spend your winter or summer vacation. We are here to take excellent care of you every minute of your stay. All of the properties on this site are privately owned, beautifully decorated, and impeccably clean. We inspect each one of them personally before every arrival. We provide everything from trip planning information to a turn key vacation rental of your dreams. Our family visited Big Sky, Montana for the first time in 2003 and immediately fell head over heels in LOVE with the area. We purchased our personal Saddle Ridge Townhome two months later and began to visit Big Sky from Nashville, TN every chance we could. We are originally from North Carolina and immediately fell in love with the dry climate, outdoor activities, friendly people, as well as, the slow pace of life in Big Sky. 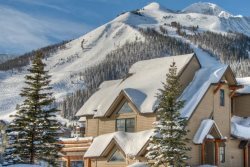 We originally bought in Big Sky because of the unbeatable ski-in/ski-out location of our Saddle Ridge, the endless ski terrain, the ever-friendly atmosphere, and the non-existent lift lines. However, after spending the summer here in 2006, night after night staring in awe at the countless stars in the "Big Sky," days fishing on the Gallatin River, and taking in the true serenity of "The Last Best Place" with our 3 boys, we realized that Big Sky was much more than just a world class ski resort. It was and is a place that we are very proud to call home. We moved here full time in July 2007 and have been operating this property management business since 2008. We are still pinching ourselves in disbelief that we are fortunate enough to live in such an amazing place. Before we moved to Big Sky, we rented our property through large property management companies. After moving here full time, we decided to manage it ourselves. We had no idea how much fun we would have and how many wonderful people we would meet through this endeavor. Over the years that we have been Moonlight Basin property owners, we have become friends with many other owners in the Moonlight/Big Sky area. Many of those private property owners have entrusted us with the exciting opportunity to manage the rentals of their townhomes, homes, and cabins. These beautiful, luxury properties are the ones that are on this site. Thank you for visiting Moonlight Rentals/ Saddle Ridge Rentals. We are looking forward to having the opportunity to meet you and to help make your time in Big Sky as special as ours has always been.